By Joana T. Coutinho, Salvador Cardona-Serra, and Alejandro Gaita-Ariño (ICMol. Universitat de València. C/ Catedrático José Beltrán no 2, 46980 Paterna, Valencia, España.). Imagine that you could store all the human knowledge in a single USB flash drive. Now imagine that you could access and select all that information as fast as you think of it. This is the main purpose of a research field that is designated as Spintronics . But what is Spintronics? Let us start by assuming the fact that electrons behave as tiny magnets, in the sense that they can be attracted or repelled by other magnets. 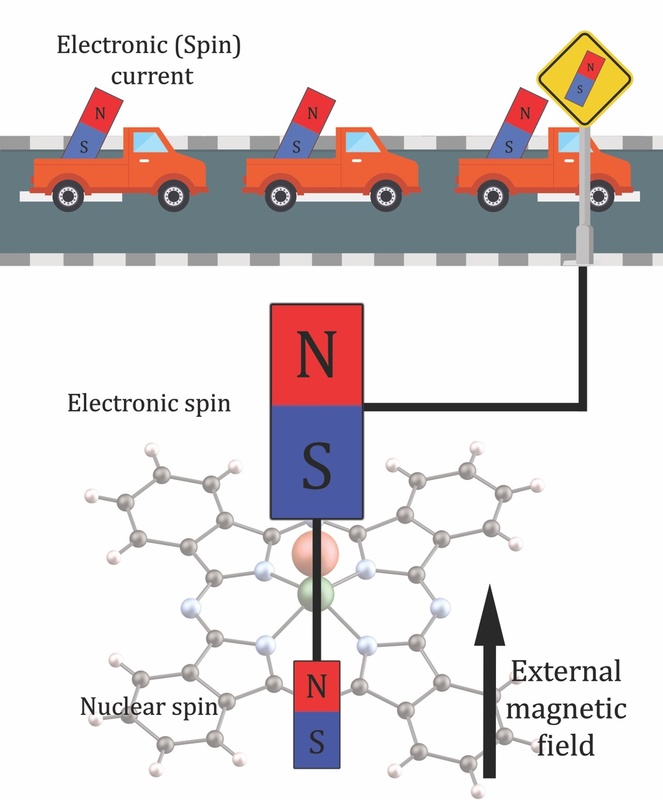 In this article we will refer to this nanoscale magnetism as ‘electron spin’. Spintronics then, is the branch of technology that takes advantage of this electrons’ property to go beyond traditional electronics (which instead only uses the electron charge). Figure 1. Old-school electronic transistors could be handled with your bare hands (1-10 mm). Integrated circuit miniaturization means tiny components in current devices (10-100 nm), but molecules are so much smaller (1 nm-0.1 nm) that quantum effects become important. If we are aiming for extreme miniaturisation, there is an important question that needs to be answered: what is the smallest object we can use in an electric circuit that has a spin? For chemists, the answer is “a molecule”, that is, a collection of atoms that are strongly bonded to each other. The use of individual molecules as components for spintronic circuit is what scientists call “single-molecule spintronics“. Single-molecule spintronics has the goal to store and process information in a more efficient way, in simple terms using the spin of a molecule to do so. We are heading in that direction, but there are some obstacles in our way. For instance, there is the need to have control over single molecules, which is not an easy task to accomplish: molecules are very small and quite fragile, and almost all of our tools are impractically large to manipulate them. Although it is not something trivial, a solid first step has already been achieved experimentally. This breakthrough-experiment consisted in preparing a single molecule circuit which behaves as a ‘super-miniaturised’ spin transistor. To understand this experiment, however, we need to first deal with some rather complicated concepts. It is important to note that the spin behaves in ways that can only be described by some special laws defined by Quantum Mechanics (see Box 1). The spin of a single electron has two possible orientation values (see Box 2). In order to have a mental picture, let us imagine a ‘discrete compass’ that instead of giving detailed information on the direction we are walking to (north-northwest, for example) can only tell us whether we are looking towards the North or towards the South. Box 1. Quantum Mechanics is a physical theory. It explains what happens at the smallest scales (molecules, atoms and particles), where classical Physics starts to fail. The effects of the very small objects are important to everyday life objects. In fact, without the mathematics of Quantum Mechanics we could not have basically any of our modern technology. A quantum state gives the physical information about a given system (position, spin, energy, …). In Quantum Mechanics, these orientations are described by different ‘quantum states‘ (Box 1). If instead of discussing about the spin of a single electron we deal with the spin of a different object, for example a molecule, there will be more than two quantum states available for the spin. Herein we will write “electronic spin” as a shorthand for the total sum of the spins in a molecule. Let us stop here for a moment. If one thinks about it, something has to be missing in that picture: what gives a meaning to the two quantum states of the spin? What differentiates “North” from “South” here? In these experiments with ‘super-miniaturised’ spin transistors, it is the existence of a large magnetic field, external to the molecule, that attributes meaning to the two spin states. It acts as a quantum analogue of the Earth magnetic field, which gives sense to the directions of a compass. In the experiments, this large magnetic field is manipulated to change with time. As a result, the electronic spin flips its orientation, but not in a continuous way, as it would happen with the direction marked by a compass if you held it in front of you while you rotate around yourself. Instead, this happens in quantum-mechanical ways: with sudden flips between a few allowed orientations. These magnetically-controlled flips affect the electrical current through the molecule. This is a fundamental mechanism in spintronics, known as spin filtering . As its name suggests, it consists in the existence of a filter (which in this case is a magnetic molecule) that allows the control of the electrical current by flipping its electronic spin. Now that we have defined the basic concepts, we are ready to discuss the solid first step mentioned above towards molecular spintronics. What is the mechanism behind this ‘super-miniaturised’ spin transistor that allows us to measure the magnetic state of a single atomic nucleus? Figure 2. 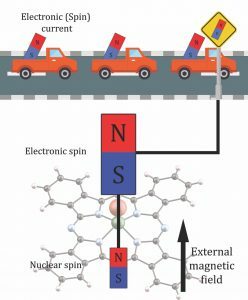 The state of a single nuclear spin controls the switch of a molecular electronic spin, which regulates the traffic of billions of electronic spins per second. To understand this, we can try to picture the special electrical circuit used as a pathway, where a large number of electrons carry an equally large number of spins. You can see this in Figure 2, where the electrons are represented by trucks. Billions of them pass, every second, through a single molecule. And it is this molecule, or more accurately its electronic spin, that is in control, acting as a filter. In this case, as with the spin of a single electron, the spin of the molecule can be in either of two ‘quantum states’, which in adequate conditions can be translated into having a high or low electron flow. A gigantic effect of amplification is taking place: a flip in the spin of a minuscule molecule has a great effect in the current . The wonderful part comes now. It is not the electronic spin of a single molecule that ultimately controls the electron transport, but something a thousand times subtler: the quantum states of its nuclear spin (see Box 2). Box 2. Atoms and molecules are composed by electrons, protons and neutrons, with the latter two being strongly bound together in the nucleus. The magnetism in everyday objects can ultimately be related to the electrons, but it turns out that nuclei also behave as nanoscopic magnets. It is important to mention that the number of spin states of a nucleus is determined by the number of protons and neutrons it is made of. Since each of them also has a ‘spin’ with two possible states, it is not uncommon for an atomic nucleus to have more than two spin states (like 4 or 8). For reasons related with the fact that nuclei weight thousands of times more than electrons, nuclear spins are much weaker magnets compared with electron spins. So, how come a weaker magnet controls the behaviour of a stronger magnet? The answer lies in Quantum Mechanics: the quantum states of the electronic spins are inseparable from those of the nuclear spins: the electronic spin cannot flip without the nuclear spin. This still leaves the question: when and how does a spin switch its orientation? In this experiment, it definitely depends on the external magnetic field. We will now describe in simple terms the dependence of the energy of each spin state with the change of the external magnetic field. This is done in substitution of the usual mathematical language, based on the concept of ‘function’ (see Box 3). Box 3. A function is a mathematical way to correlate an input (x) to exactly one output (y). For instance, applying the squaring function (y = x2) to the positive integers less than 6, one will obtain 1, 4, 9, 16, 25 as output. Figure 3. 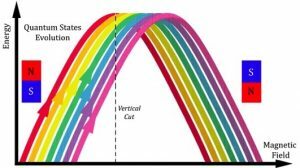 Each ribbon of this colourful rainbow represents a different quantum state. On the left, we have the effect of a very large external magnet with the North Pole pointing up, and we can think of the electron spin as also pointing up. The opposite situation is found on the right. Let us picture a rainbow of folded ribbons, similar to the one presented in Figure 3. At a given time, the magnetic field takes a given value. We represent one such moment by a vertical line in the drawing. Each of the ribbon intersected by this vertical cut represents a possible ‘quantum state’ of the spins in the molecule. In this case the quantum state can be summed up in ‘which directions do the spins point to?’. A key point here is that both the electronic spin and the nuclear spin are involved in these quantum states simultaneously, so they also flip simultaneously. In the experiment the magnetic field is continuously varied by the researcher, and at some particular field the spins flip and a change in the current is detected. For instance, in Figure 3, this happens at the red ribbon in the line marked as vertical cut. As seen in the figure, different coloured ribbons – which is to say the different nuclear spin states – present folds at different values of the magnetic field. This is the trick that allows us to know what is the nuclear spin state in a minuscule molecule – just by relating the magnetic field and the change in electric current, both of which can be controlled by regular-sized apparatuses. So far, we have described in simple terms an experiment that was performed using a particular molecule. But it is crucial to note that different molecules have different properties, and some are more suitable for some tasks than others. Not every molecule is adequate for the task of spin filtering, much less for being part of a device that is apt for nuclear spin sensing. In fact, very few molecules are! Additionally, one needs to consider that these extraordinary experiments, which indeed are a very promising first step, are also extraordinarily demanding, both in terms of human efforts and of resources employed. It would be very convenient, as a second step in this progress towards single-molecule spintronics, to have a way of predicting which molecules are going to do a better job, instead of trying and missing. In theory, the equations of Quantum Mechanics would be able to give us all the answers. In practice, these equations are too complex to be solved, even using the most advanced supercomputers . So, at the lack of an exact and complete answer, one needs to come up with reasonable approximations that give us some kind of useful information. 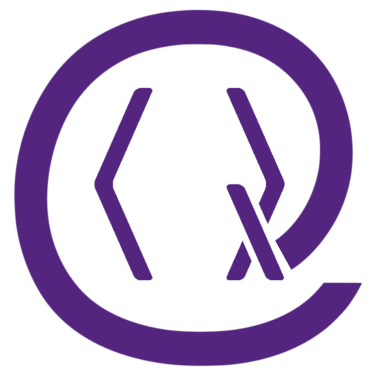 What is the current status on that? In few words: not brilliant, but we have some clues. hold its electronic spin in such a way that it is not substituted by one of the electrons spins of the current. To evaluate these criteria, one needs meticulous information on the inner details of the molecule. This could be achieved by evaluating different molecules theoretically . However, it should be kept in mind that models are limited. So far, it is possible to differentiate between families of molecules that show some potential from others which are probably not so useful, but it is impossible to make accurate predictions. Up to some point, advances in the theoretical tools will improve the predictive capabilities, but there is also a fundamental limitation: these experiments are extremely challenging, in the sense some variables cannot yet be controlled. In particular, researchers cannot exactly determine the disposition of the molecule in the circuit. Thus, even if one was able to do perfect calculations, it will be fundamentally impossible to reproduce the experiments until the experimental control becomes more sophisticated. There is still a long way to go until we have a technological control over single molecules, which can be comparable to the one exerted by the biomachinery in living cells, but we are on the right track. The Scientific field of spintronics, is the concept of having control of molecules using their subatomic attraction to each other through their magnetism. Spintronics also looks at the spin of a molecule and how we can use it to help us expand our overall knowledge in the world of quantum mechanics, and science in general. ‘Spintronics’ in itself is the magnetic attraction between electrons, and other subatomic particles. The report also covered ‘spin filtering’, which is the magnetic molecule allowing control of the electrical current through the molecule by flipping its spin. We understand the basic concept of the paper, which we believe is trying to control single molecules and the experiments and the experiments taken in this direction. However, the main goal of the paper was fully understood only at the end of the paper. We do not understand how the theory of spintronics relates to the rest of the paper, e.g. how electrons functioning as miniscule magnets relates to storing information. Our aim was to translate one of our own research papers , making it understandable for teenagers. It was an intellectually stimulating and deeply humbling experience. We were aware of the fact that sophisticated concepts need to be based on more fundamental ones, many of which are not there yet in this early stage of scientific education. With this in mind we chose a strategy and a 'tree of key concepts' to be introduced, such as quantum mechanics and quantum states, electrons, nuclei and their spins, and also mathematical functions. We dedicated three text boxes to that purpose, trying to be comprehensible but correct, avoiding an overly phantastical or metaphorical language. Our goal was to offer concepts to these students that they could use later in their lives. To explain the core of the work in our paper, we explained the main ideas in words, stressing the context rather than the details. We added a couple of colourful figures to convey two key processes: spin filtering and the evolution of electronuclear quantum states in an avoided crossing. The first evaluation was dismal. It seemed that practically no significant information had been transmitted. Thus after refereeing we produced a second version which was completely revamped, crucially including sections with titles that we hoped would allow to follow the contents, an extra figure to help grasp the sizes involved in molecular electronics and a few extra references for those with interest in digging a bit deeper. We also allowed us to go one page above the recommended 3-page limit. The result was still very tough: it seems that a few important ideas did get through this time, which of course is great, but so did a few misunderstandings. We also realized that a couple of concepts, which were very important and which one could have explained, simply were not properly conveyed even in the second version. We think that with practice and with feedback this could get somewhat easier, although never really easy. Probably an extra week of effort for every paper would result in versions from which an interested high-schooler -or in general an interested member of the public- would be able to understand much more than in the typical press release. This could serve to cultivate an empty and potentially fertile region somewhere between high-school textbooks, scientific papers and general outreach material. Awschalom, D. D.; Epstein, R.; Hanson, R., The diamond age of spintronics Scientific American 297, 84-91 (2007). Sanvito, S., Organic spintronics: filtering spins with molecules, Nature Materials 10, 484-485 (2011), 10.1038/​nmat3061. Thiele, S.; Balestro, F.; Ballou, R.; Klyatskaya, S.; Ruben, M., and Wernsdorfer, W., Electrically driven nuclear spin resonance in single-molecule magnets, Science, 344 (6188), 1135 (2014), 10.1126/​science.1249802. Dirac, P. A. M., Quantum mechanics of many-electron systems, Proc. Roy. Soc. A, 123, 714-733 (1929), 10.1098/​rspa.1929.0094. Cardona-Serra, S.; Gaita-Ariño, A.; Stamenova, M.; Sanvito, S, Theoretical Evaluation of [VIV(α-C3S5)3]2– as Nuclear-Spin-Sensitive Single-Molecule Spin Transistor, J. Phys. Chem. Lett., 8, 3056 (2017), 10.1021/​acs.jpclett.7b01376t. On Crossref's cited-by service no data on citing works was found (last attempt 2019-04-25 13:07:38). On SAO/NASA ADS no data on citing works was found (last attempt 2019-04-25 13:07:38).